LOS ANGELES, California (CNN) -- Rapper Kanye West and his business manager face vandalism, battery and grand theft charges in connection with a scuffle with photographers at Los Angeles International Airport last September. 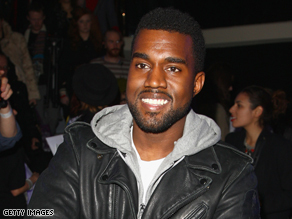 Rapper Kanye West has been charged after an incident last year involving two photographers. The Los Angeles County district attorney declined to file felony charges, but L.A. City Attorney Rocky Delgadillo decided to charge West, 31, and Don Crawley, 33, with misdemeanors Wednesday. Police arrested West on September 11, 2008, after an altercation with two paparazzi, airport police said. The incident, which took place near the airport's Terminal 4, occurred between the rap star and Crawley -- his road manager and bodyguard -- and a photographer and a cameraman who were taking their photos, airport police said. The cameras of the paparazzi were damaged in the altercation, police said. West was charged with one count of vandalism, one count of grand theft and one count of battery, according to Frank Mateljan, the spokesman for the city attorney. Crawley was charged with two counts of vandalism, two counts of grand theft and two counts of battery, Mateljan said. If convicted of all charges, West could face up to two years and six months in jail, while Crawley could face up to five years, he said. Their arraignment hearing is set for April 14 at the Los Angeles Airport Courthouse, he said. West, a 10-time Grammy winner, and Crawley were in the airport to catch a flight to Honolulu, Hawaii, police said. The pair were outside of passenger security screening when the incident occurred. CNN could not immediately reach the star's publicist for comment. The celebrity Web site TMZ posted a video of the incident shot by one of its reporters, who was also in the terminal when the altercation occurred. The video was short and chaotic, and the man whom TMZ identifies as West never shows his face, which is shrouded in the hood of a gray sweatshirt. According to the Web site, after West grabbed the camera from the photographer, Crawley took it from him, leaving the rap star with the lighting component. The video shows the man in the gray sweatshirt and another man in a red sweatshirt -- whom TMZ identifies as Crawley -- each smashing parts of a camera on the ground. Then the man in red approaches the camera as it is filming. He reaches out for the camera, and it appears a struggle ensues. As airport officials arrive, the man walks off. TMZ reported that after the incident with the first photographer, Crawley grabbed the TMZ reporter's camera and allegedly broke it. Police stopped West and Crawley as they tried to leave to go through security to board the plane, the Web site said. TMZ is partly owned by AOL, part of CNN's parent company, Time Warner. West quickly became a hip-hop star after his first album, "College Dropout," debuted in 2004, earning him a best rap album Grammy that year. He twice matched that feat with 2005's "Late Registration" and 2007's "Graduation." West also has won three best rap song Grammys for his hits "Jesus Walks," "Diamonds from Sierra Leone" and "Good Life." His other four Grammys include two best rap solo performance awards, one for best rap performance by a duo or group, and one for best R&B song for his role in helping write "You Don't Know My Name," a song performed by Alicia Keys. The platinum rapper is also known for controversial outbursts, most notably in 2005, when he went off script during an NBC telethon for victims of Hurricane Katrina, saying, "George Bush doesn't care about black people." All About Kanye West • Hip-Hop and Rap • TMZ.com Inc.